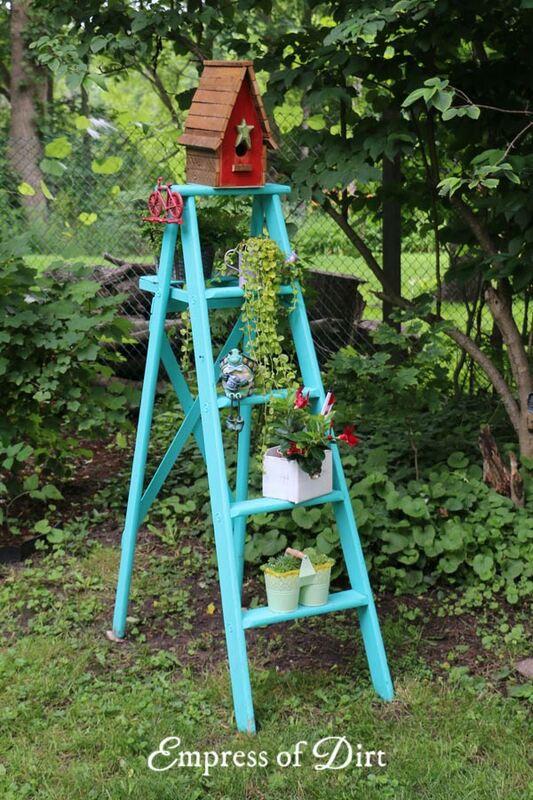 Want a way to make a wooden garden art ladder last for years? Put boots on it! With kid rain boots and a fresh coat of exterior paint, it will carry on for several years to come. 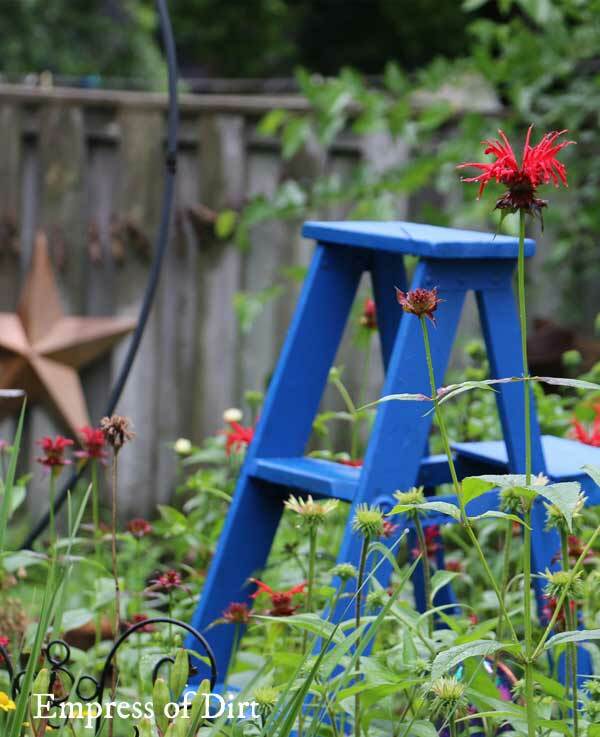 For more ideas, see the Gallery of Garden Art Ladders. 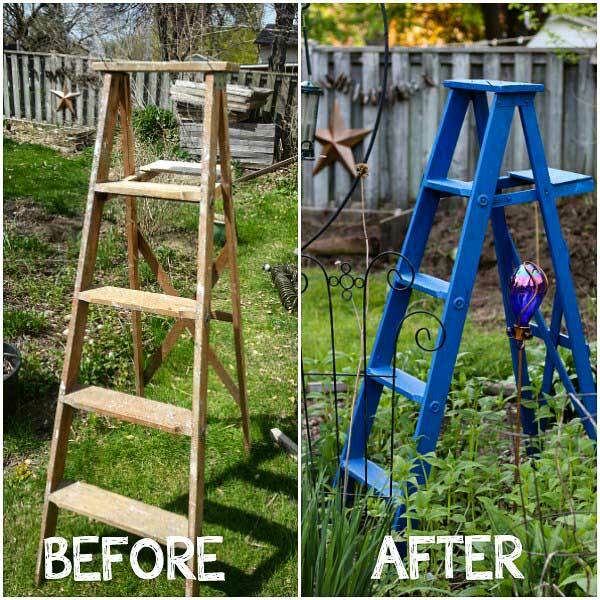 I love using old, wooden ladders in the garden but, if they are made for indoor use, the weather can be really tough on them. Intended to keep this ladder plain, complete with paint splatters from its original owner, but, after a few seasons I saw that the wood around the feet and legs was starting to rot. The solution? 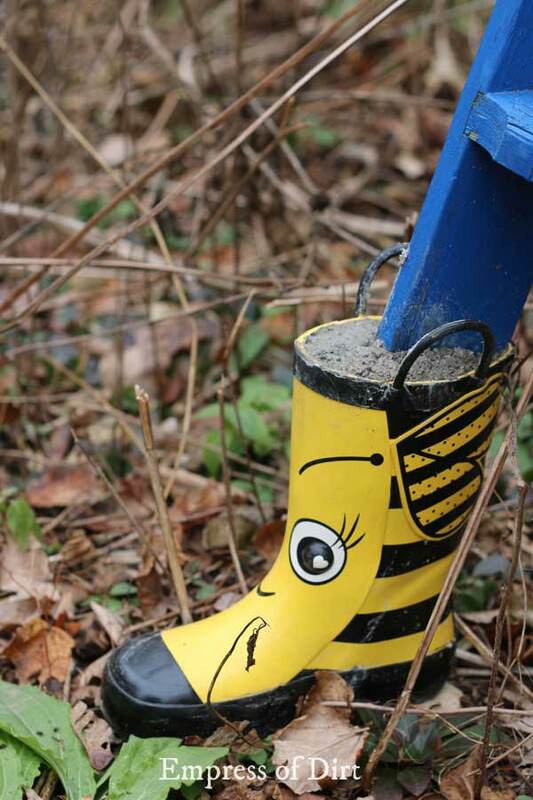 A fresh coat of exterior paint and kiddie rain boots! First, to protect the entire piece, I used exterior latex paint with built-in primer and a protective glossy coat. The ladder was painted a few years ago and this really helps protect the wood. I just have to touch up the horizontal surfaces once a year, wherever rain and snow might sit, as it does cause gradual wear. Despite the paint, the feet were showing signs of wear from exposure to dampness. I got two pairs of children’s rain boots and attached them with Quickcrete (cement mix that only requires water). My hope was to find ladybug boots but I soon learned that they cost a fortune, even at thrift stores ($50!). 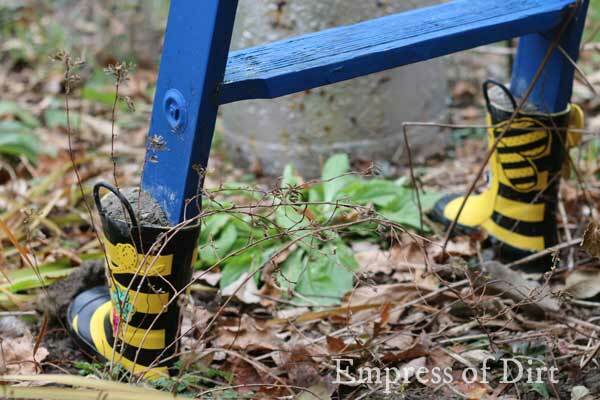 So, when I found two pairs of bumblebee boots ($5), I figured I better go for it. I’d rate this as an easy project. I mixed a small amount of Quickcrete with water in a bucket. I used stone Quickcrete (there’s also sand Quickcrete) but I don’t think it matters for this project. Use a mask so you don’t breathe in any cement dust. Working on a flat surface with a tarp (the patio), fill the toes of the boots with mixed Quickcrete, then set the ladder feet into the boots. 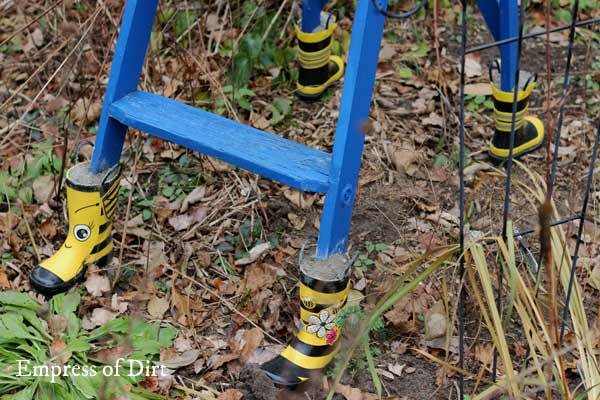 Use a spoon to fill all the gaps around the ladder feet (within the boots) with more mixed Quickcrete. 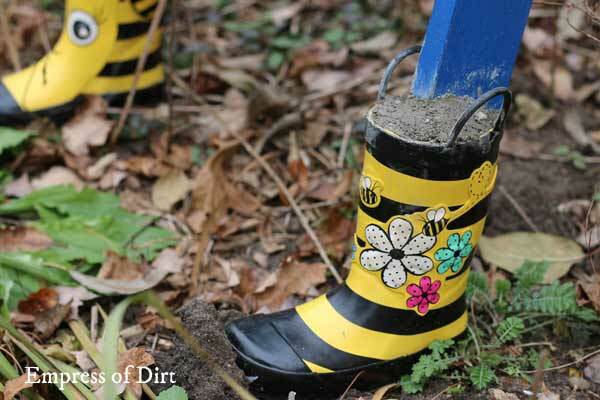 Add extra mixed Quickcrete at the tops of the boots. You want it so the rain will run off and never pool up on the boots. Quickcrete is fast-drying and the project is ready in a few hours. Adult-size boots could work too. Just make sure the height of the boots is lower than the bottom rung. 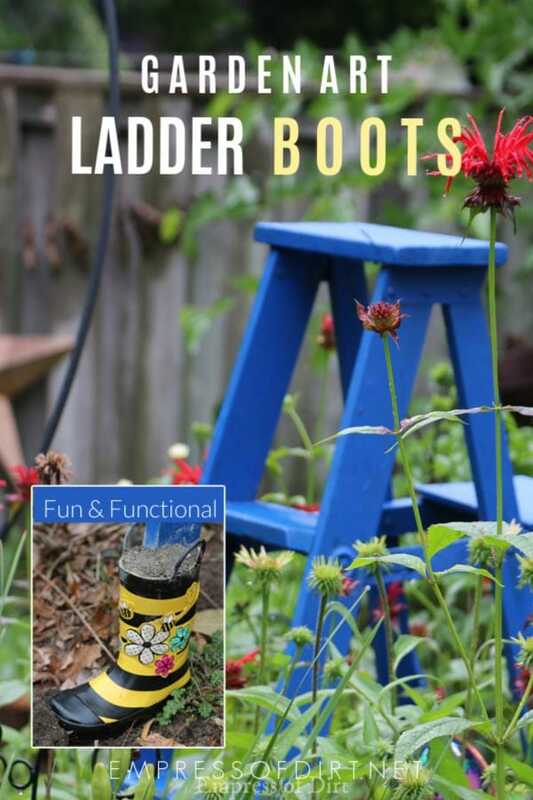 You could also use boots to make a ladder higher by setting the feet half way up the boots. They crack me up. Kind of fun and ridiculous looking! You could also paint socks on the ladder legs. This may be easiest before cementing the boots on, but, either way it would be funny. Thanks to my mom for that idea!